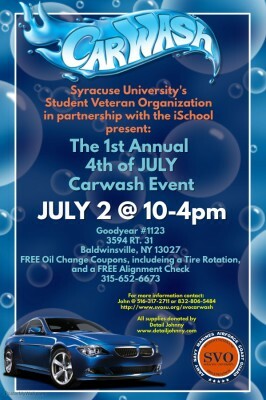 The Student Veterans Organization, in partnership with the School of Information Studies, is holding an Independence Day Car Wash on Saturday, July 2, to benefit the organization’s events. The car wash will be held at the Goodyear service center, 3594 Route 31, in Baldwinsville from 10 a.m. to 4 p.m. Goodyear will be giving out free oil change coupons, which come with a tire rotation and free alignment check. Monster energy drinks will also be supplying drinks. Organizers are also looking for volunteers to help with the car wash.
For further information, contact John Miccio, president of the Student Veterans Organization at Syracuse University, at 516-317-2711 or jmiccio@syr.edu.